The pro-bono Walk-Bike Blairgowrie community project goal was to protect the relaxed, less urbanised seaside feel of Blairgowrie – by encouraging walking and cycling rather than short trip car use. 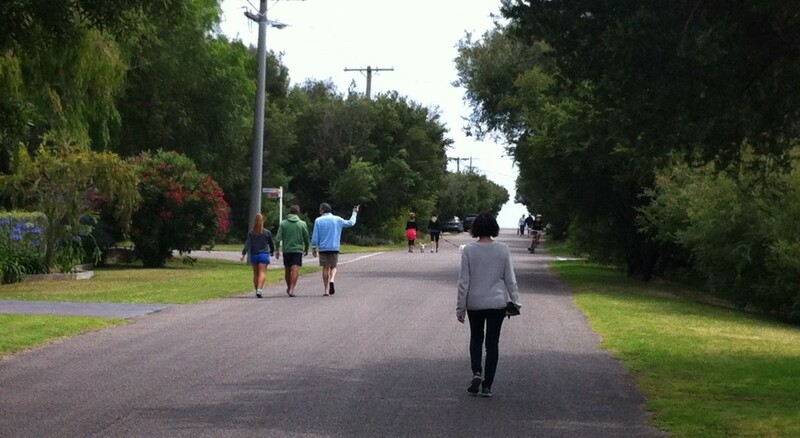 Improving opportunities for an active lifestyle brings fun, health, tourism and sustainability benefits to the community. The impact of our options analysis proposal and regular engagement with council’s asset management director and community groups over the course of two years most likely influenced Councils behaviour. 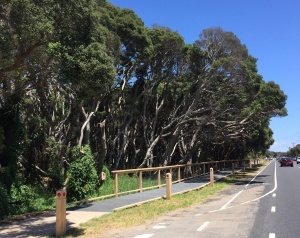 Council has initiated and is nearing completion of walking paths along the Nepean Highway road reserve in Blairgowrie – linking residents to the shops the primary goal of the project. We are about small cost changes, for big benefits. We are about engaging with Council and the community for quick actions and lasting results. When everyone sees something as a good idea, then let’s do it together. 1. 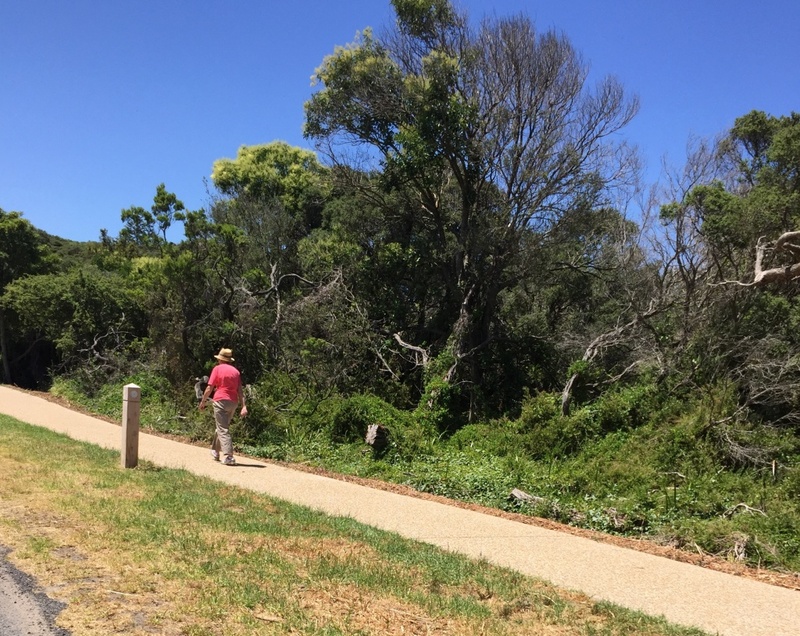 Re-instate a continuous walking track in the Pt Nepean Road public road reserve, generally 20m back from the main road towards the houses, by linking over-grown paths, existing service roads and the new paved shared paths. This will provide a direct enjoyable opportunity for locals to commute-walk to the local Blairgowrie shops and for tourists to enjoy an outing-walk from Rye to Sorrento – Completed with some variation. 2A. A large bicycle rails installation at the Blairgowrie shops to encourage cycling rather than driving to the shops. 2B. Bicycle rails opposite each bus stop on the Nepean Hwy – in prominent locations. Ride to the beach. Links to public transport. Remind people driving along the highway that Blairgowrie is a cycling community – potentially up there with Amsterdam or Copenhagen! A great additional non-beach attraction for tourists to B&B’s. 3. Enable the community to identify locations where walking beside the road becomes hard, and to identify gaps in current walking or cycling tracks via the tool www.crowddata.com.au. The action from this community input should be on joining the simplest to action paths. 4. Petition VicRoads for many more pedestrian refuges/islands in the Nepean Highway for safer crossing. 5. Prohibit further planting by residents outside of their property grounds and encourage the removal of planted out road verges.Currently most residential roads are without footpaths yet many home owners have planted out shrubs and plants to the edge of the roads requiring pedestrians to walk on the roads. This is not safe or as attractive a walking experience as walking on grass under tee-trees. A rate deduction should be offered for the first 200 people each year who once inspected and approved by a council officer clear a previously planted path. 6. Promoting a “middle way” where people can walk or cycle through the township away from the main roads but parallel to Pt Nepean Rd. This “middle way” should link up to and finish near the key recreational centre of the Rye sports ground (where football/cricket/gym/tennis/skate boarding/basketball are all played). The only missing link is from Bimbiang Crescent near the football ground to Sarazan St.
7. Identify one new location for a small mixed use business to be established – to enable most Blairgowrie residents to easily walk to the local shop rather than drive – a basic sustainable community initiative. A short term trial might involve a pop up outlet or coffee/food truck locating at a proposed location over the Christmas – Australia Day period. Currently the walkscore suburb score of Blairgowrie is 22 – placing Blairgowrie 325th on the scale of walkable suburbs/townships surrounding and within Melbourne. The poor score confirms people do not live close to shops or services – and they rely on driving to these. This score can readily be improved by this recommendation. Current mixed business providers on the Peninsula would be canvassed for interest in running another store, that fits into their supply route. Planning could also convey it’s in principal support. 8. Promote the loop bicycle link: Rye-Portsea via Nepean Hwy and returning Portsea-Rye via Melbourne Rd. Also promote further the Point Nepean National Park ride. For more details feel free to contact Craig Harris of Low Impact Development (LID) Consulting on info@lidconsulting.com.au or 0434 911 404.